We start from a freshly installed Ubuntu Linux server-edition installation (Maverick Meerkat distribution, 10.10) having chosen the "server" package set. Ubuntu creates a normal user as part of the installation, with the ability to use sudo where root is required. Ubuntu includes packages with pre-built Virtuoso binaries. You can install Virtuoso using these, or, if a newer version is available upstream or you want to specify your own configuration options, you can build directly from source. 0 packages upgraded, 34 newly installed, 0 to remove and 0 not upgraded. Need to get 19.7MB of archives. After unpacking 61.3MB will be used. 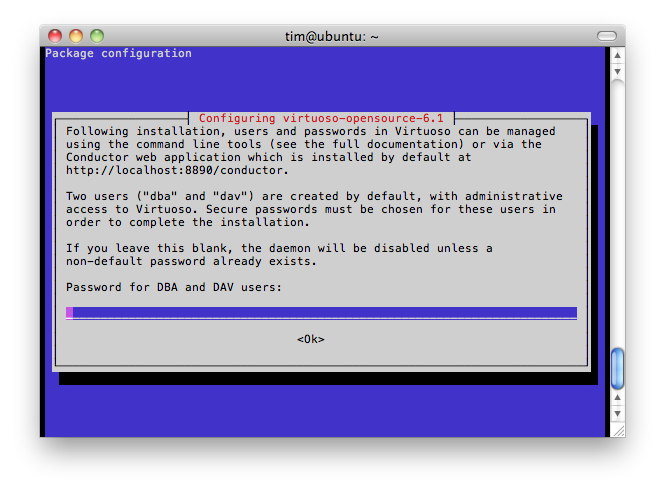 At this point Virtuoso is installed and an instance created and running. In accordance with Debian policy that services should start immediately after they've been installed, Ubuntu have created a default instance based on a configuration file located at /etc/virtuoso-opensource-6.1/virtuoso.ini; the database itself lives in /var/lib/virtuoso-opensource-6.1/db/ (a similar layout to MySQL, PostgreSQL, etc). At this stage you can start using Virtuoso through the Conductor web interface and the iSQL command line utility, or install more options. Ubuntu have split some of the Virtuoso VAD packages into separate apt packages of their own. When you apt-get install these, all you get is the VAD package on disk ready to be installed into your database; Ubuntu does not install the VAD into any running instance for you (because by this time you might have created your own instances elsewhere on different ports). Selecting previously deselected package virtuoso-vad-isparql. Selecting previously deselected package virtuoso-vad-ods. Selecting previously deselected package virtuoso-vad-cartridges. In the Conductor (http://localhost:8890/conductor/), go to SysAdmin --> Packages and the iSPARQL, Cartridges and Tutorial, and ODS * (of which there are several) packages will now be available. There are 2 ways to build Virtuoso from source: using Ubuntu packages or the generic source build that works everywhere. First we install the minimum Ubuntu build environment - basic C compilers and development headers. Need to get 19.7MB of archives. After unpacking 59.6MB will be used. Need to get 69.4MB of source archives. 0 packages upgraded, 286 newly installed, 0 to remove and 0 not upgraded. Need to get 103MB of archives. After unpacking 346MB will be used. dpkg-deb: building package `libvirtuoso5.5-cil' in `../libvirtuoso5.5-cil_6.1.2+dfsg1-1ubuntu4_amd64.deb'. Selecting previously deselected package libvirtodbc0. Selecting previously deselected package libvirtuoso5.5-cil. Note: Useful prior reading: please see the VOSBuild and VOSMake pages in the VOS Wiki. Here we settle for asking for read-line support, i.e., the ability to cursor-up/down and use typical read-line key-combinations in the command-line isql tool (once built). Virtuoso instances usually take the form of a designated directory somewhere in the filesystem, centered around a configuration file (nominally virtuoso.ini) which specifies operational parameters such as the filenames of database page files, port numbers, numbers of threads and buffers, etc. -- where the latter options specify default locations into which the VADs, documentation (HTML and PDF), demo and default instance databases, and hosting libraries will be installed, compatible with the packaging requirements of the various named OS distributions ("opt" means a prefix of /opt and OpenLink is the default, detailed above). Unfortunately, both unixODBC and Virutoso provide a command `isql', used to access data sources from the commandline (in unixODBC, an ODBC DSN; in Virtuoso, the SQL interface). In order to allow both packages to coexist, Ubuntu rename Virutoso's isql command to isql-vt. Given that we are installing Virtuoso from source to a different prefix (/usr/local), it is not absolutely necessary to do the same here, but to avoid having to specify different PATH considerations and to otherwise make life easier, the configure command above reflects this change as well. Optionally, you can run make check to run the test-suite (beware, it takes some hours and multiple gigabytes of disk-space). Take a copy of the default virtuoso.ini and store it safely in case you make erroneous changes. Here we see the server running in foreground mode with maximum debugging information. Because it's the first time this instance has been run, Virtuoso creates a bunch of files (virtuoso.db, virtuoso.trx (the transaction log), etc. ), and installs the Conductor VAD package (and any other VAD packages now found in the, e.g., /usr/local/share/virtuoso/vad/ directory) into the database. If you close your terminal while this command is running, Virtuoso will stop. To run it as a daemon instead, omit the "-d" ("+debug") option, or add " &". The latter option will keep full debug information flowing to both console and log. To keep full debug information flowing to the log, but keep the console clear, you can edit the CommandLine? value in the virtuoso.ini file. You can still see most of what's happening by running tail -f virtuoso.log. You can access the Conductor interface by pointing your web-browser at http://localhost:8890/conductor/ (substitute hostname as appropriate). From the Conductor, you can manage users and automated backups, install VAD packages, execute SQL commands in a web-based iSQL tool, configure the Virtuoso Sponger, and loads more. dav --the WebDAV adminstrative account. By default each of these accounts has its password set the same as its username. It is strongly advised that you change these as soon as possible for obvious security reasons. The default settings for Virtuoso Open-Source create about 29MB of database filesize, with a 160MB process size in memory, and a total of about 237MB disk footprint; this has 20 client-access threads running for database and/or web-server use. We also provide detailed documentation of how to scale Virtuoso.